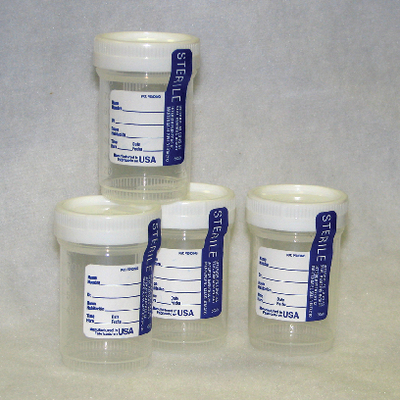 These clear, 100% virgin medical-grade polypropylene containers are specifically designed for the collection and transport of microbiology, urinalysis, and drug testing specimens. Containers are supplied with the SURE-LOK® proof-of-closure system. Screw-thread polyethylene caps provide a leak-resistant seal. Molded-in features on both the cap and container provide visual and tactile assurance of a secure seal. When the indicator on the cap aligns at or beyond the indicator on the container base, the container is firmly closed. Sterile containers are labeled with a security tab. Note: Containers are intended for single use, although the container base may be autoclaved at 121°C (250°F). Caps are not autoclavable. Containers are crack-resistant and feature molded-in graduation markings on three sides. The top and bottom of each container is equipped with a positive grip-knurl to ease in opening or closing when handled with gloves. The straight-sided construction increases stability and allows containers to be stacked. Certifications: Containers are 95kPa approved. Ordering information: Container 82030-406 is individually wrapped. Container 82030-444 is packaged as a dispenser pack. Container 82030-376 is supplied as a container base only, without lid.